I have another red, white, and blue card today that's going into my final OWH box. I used a PTI Center Stage coverall die to cut the red self-adhesive cardstock panel, and adhered it to a navy card base. I added the white MB prim poppy die cut, along with a SSS small "love you" die cut sentiment, and this card was done! I'm entering this into the little red wagon challenge #291 - which is to use red, white, and blue colors. This is a very nice card. I love that coverall die. I don't think I've seen it before. It is very attractive and this card could be for either gender. That box must be getting quite full by now as you have shared many gorgeous cards that are going into it. Have a good day. Another fabulous card Carol, great design - the white poppy really stands out against the darker background. How many cards you have done for OWH! This CAS is so elegant, with these white poppies and the beautiful background! Great work! Carol, this is stunning!!! 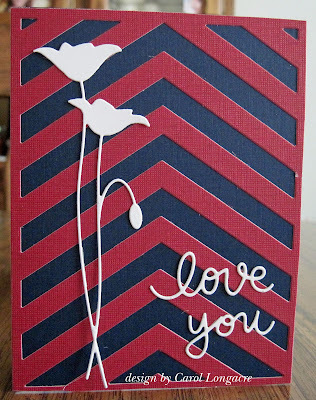 A wonderful way to do the red and blue and the poppy in white really makes the entire card pop! LOVE IT! Very simple yet it speaks volumes. Great card. Another fabulous card design Carol, and great use of the super dies. I just love that center stage die. I think I have one left from when I used yours. It makes the prettiest cards, and this one is no exception.